Safflower oil, gelatin, glycerin, sunflower lecithin, purified water, sorbitol, maltodextrin, carob color, silica, modified food starch. Some degree of cognitive decline is a given as you get older. 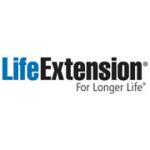 That's because levels of neurotransmitters and other brain compounds diminish with age. And that can impact what you understand, process, and remember. 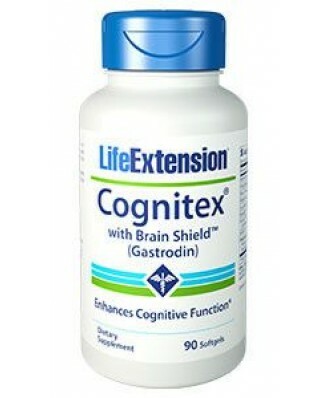 But with the proper nutrients, you can take steps now to support youthful cognition and memory. 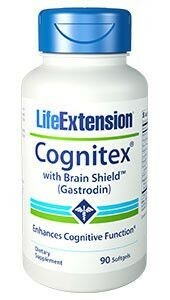 Cognitex with Brain Shield contains 11 boosting ingredients in one advanced formula. Read the entire label and follow the directions carefully prior to use. Directions: Take three (3) softgels in the morning with or without food. Not for use by individuals under the age of 18 years. Do not use if pregnant or nursing. Consult a physician or licensed qualified health care professional before using this product if you have, or have a family history of breast cancer, prostate cancer, prostate enlargement, heart disease, low "good" cholesterol (HDL), or if you are using any other dietary supplement, prescription drug, or over-the-counter drug. Do not exceed recommended serving. Exceeding recommended serving may cause serious adverse health effects. Possible side effects include acne, hair loss, hair growth on the face (in women), aggressiveness, irritability, and increased levels of estrogen. Discontinue use and call a physician or licensed qualified health care professional immediately if you experience rapid heartbeat, dizziness, blurred vision, or other similar symptoms. Do not take this product if you have a history of seizures. If you are taking anti-coagulant or anti-platelet medications, or have a bleeding disorder, consult with your healthcare provider before taking this product. Keep out of reach of children. Store tightly closed in a cool, dry place.